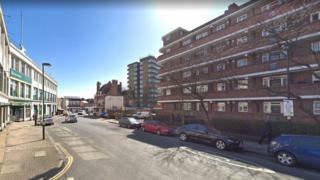 A man has been stabbed to death in north-east London. Emergency services were called to reports of a stabbing on Matthias Road, Stoke Newington, at 17:47 BST. Despite treatment from London's Air Ambulance a man, believed to be in his 30s, was pronounced dead at the scene. A crime scene remains in place, and police have been granted increased stop and search powers in the surrounding area. No arrests have been made.